My CrAp ShEEt: Dah Makan? These days, more and more food delivery services are mushrooming in the city, which may or may not be a good thing, depending on how you look at things. The good thing is, your next meal is basically a few clicks away and for busy people who has little to no time to cook, this is a very welcomed idea. All you need to do is order your foods online, make payment and wait for the foods to be delivered right to your doorstep or to your office. The not so good thing is, some of the food delivery services may not be pocket-friendly especially with the increase of prices of basically everything these days. 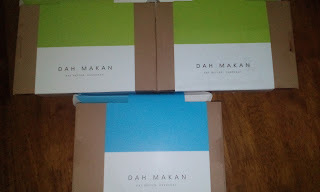 I have never ordered from any independent food delivery services before this but recently I heard about a company aptly named Dah Makan. It so happens that my husband's birthday fell on Wednesday so of course I'd want to have a celebration with him. However, it being a midweek and because I have a court hearing in Shah Alam the next morning, the thought of going out to dinner with two small kids is just a bit too hectic. So I told hubby that I will treat him to a proper birthday dinner this weekend. However, we still need to have dinner that night but I was just too lazy to cook something that I decided to make my very first order from Dah Makan. 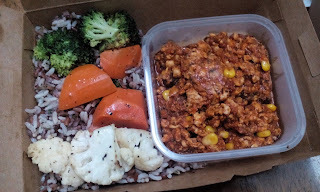 Wednesday, 9 December 2015 dinner menu was Chili Con Pollo with Sweet Corn and Kidney Beans and Wild Rice Pilaf and Vietnamese Seared Beef Rice Noodle Salad with Fresh Vegetables and Spicy Fish Sauce. I ordered two sets of the Chili Con Pollo and 1 set of the Rice Noodle Salad. they also have drinks and snacks but I didn't order those as I bought two slices of cakes and a slice of pie for him. I set the delivery time for 7.30-830p.m. However, the delivery came at 7.10p.m. Efficient service, I must say. Only thing is, at that time I just reached home and was just about to give the kids a bath when the delivery guy called. Since the delivery reached early, by the time we sat down for dinner at 8+, the foods were getting cold. 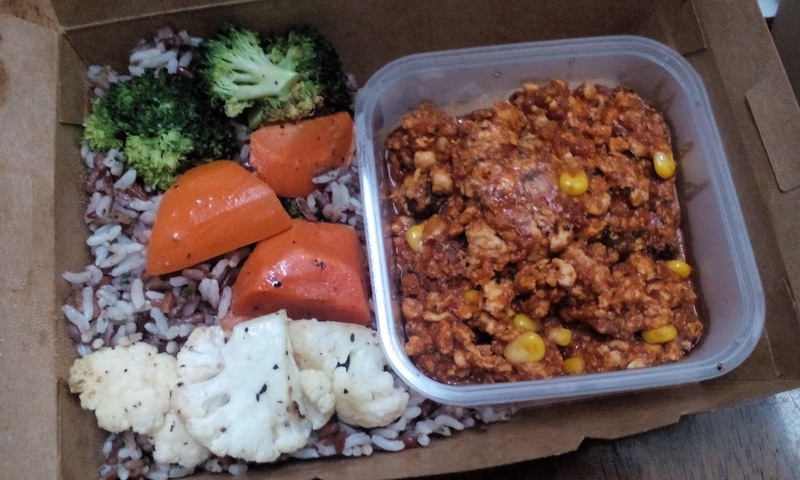 This is the Chili Con Pollo with Sweet Corn and Kidney Beans and Wild Rice Pilaf and it is RM18.00 each. In the website, they stated the list of ingredients and the calories for each meal so you know what you're eating (not that I am counting my calories, btw). The meal is nice but honestly it is a bit bland. They claim to deliver healthy foods but healthy foods can be tasty, right? To me, this meal is just OK. Nothing great, really. And to think that I paid RM18 for this, I can say that it is a bit overpriced. The vegetables were tasteless. I feel like eating them with some kicap (soy sauce). 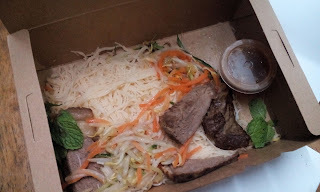 This is the Vietnamese Seared Beef Rice Noodle Salad with Fresh Vegetables and Spicy Fish Sauce. I ordered one set of this.When I opened the box, that is how it looked like. It is basically plain meehoon with some beansprouts, carrots, a few mint leaves and a few slices of beef. The beef slices are no doubt very tender and juicy but the rice noodle is just too bland. The fish sauce barely taste anything. Again, I feel like putting a few dashes of kicap (soy sauce) to enhance the taste. This dish is RM19. To tell you the truth, I should have spent the RM19 to buy a packet of meehoon, some vegetables, fishballs and fishcakes and I can fry my own meehoon which tastes a whole lot better and I will have leftovers to pack for lunch the next day! All in all I spent RM55 for the above meals. We were full, no doubt about that but we were not satisfied at all. I should have ordered pizza from Dominos or some chicken from Nando's which I know for sure how the taste is like. Oh well, at least I have tried and at least I put something on the table that night. But then again, taste is subjective. You may like their foods. And maybe the other foods on the menu taste better, I don't know. But with that price per meal, I will definitely think twice if I were to order again from them. Before I forgot, there is no delivery charge for my order as I am located within the 'dark area'. Check out their delivery areas for more details. Do let me know if you have ordered from them and tell me what you think.